James Lambert’s unfulfilled ambition was to be a painter in oils of imaginary landscapes, but by temperament he was not suited the competitive artistic world of London. So he stayed in Lewes and from the 1760s to the 1780s undertook many of the types of painting for which there was demand outside London. He became the first painter in eastern Sussex to be an artist rather than a craftsman; he was also a stationer and a musician. We know of some 700 pictures made by him, often with his nephew’s assistance. They include many drawings and watercolours of Sussex’s historic buildings commissioned by serious students of the past, with copies sold to visitors wanting souvenirs. 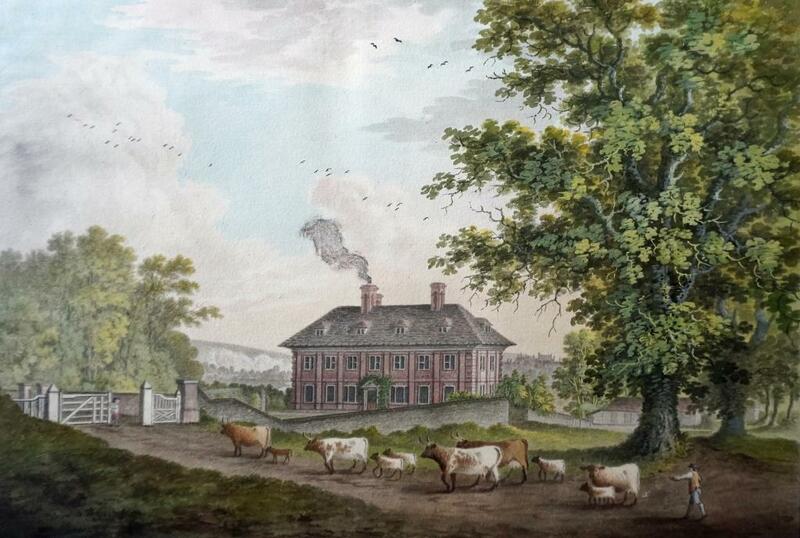 He also captures the gentry’s houses (and livestock), for their proud owners. A view of Malling Deanery is shown below, courtesy of the Sussex Archaeological Society. For the information of those members unable to attend Greg Chuter’s fascinating talk in March on the archaeology of Malling Down, one of the high points was his revelation of the results of the tooth enamel analysis of samples from the group of a dozen skeletons discovered buried there in a shallow grave. Some were excavated by the late Richard Lewis in 1973 and the remainder by Greg and the Lewes Archaeological Group about 30 years later. All were males, between the ages of 15 and 25. Most had been pitched into the grave face down, apparently at the same date, with their hands still tied behind their backs. As the only associated find was a single simple buckle, their bodies may have been stripped of everything of value. Carbon-14 dating put the date of their execution within the range 980-1020 AD. While they could have been locals who fell foul of the Saxon authorities, an alternative explanation is that they were captured Viking raiders. The Anglo-Saxon Chronicles record extensive Viking raids along the Sussex coast in both 994 and 998 AD. Modern enamel analysis can distinguish the areas in which people grew up, and the L.H.G. was amongst the local groups who contributed to the cost of this for these skeletons. The results were unambiguous – these men were not locals, but had grown up in an area of harder geology, as found in South-West Wales, South-West Scotland and parts of Norway and Sweden. 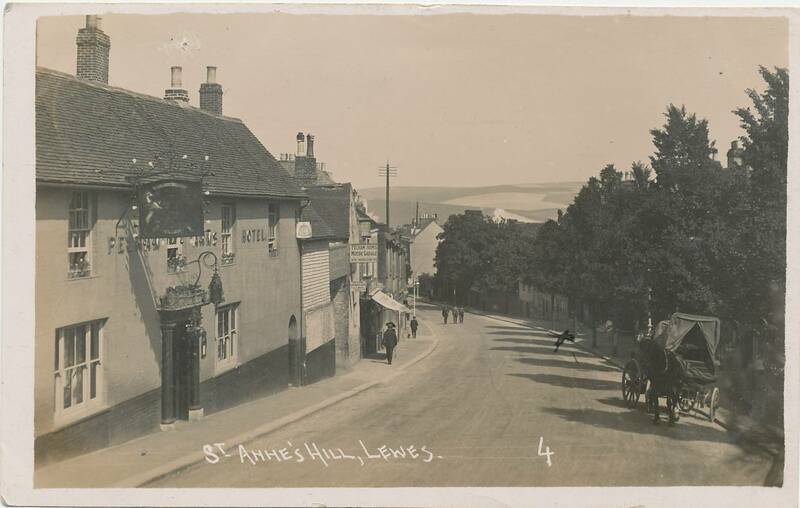 This postcard of St Anne’s Hill was published by the S.P.P. Agency of 12 Richmond Terrace, Brighton. It was posted from Lewes in 1911 and features the Pelham Arms Hotel. As signs of the times the Pelham Arms bears an advertising sign that ‘You can telephone from here’ . Other signs advertise the Pelham Arms Motor Garage with inspection pit and that open and closed carriages are for hire. The Lewes branch of Barclays still carries the name ‘The Old Bank’, despite this having been one of about 20 London and country banks that amalgamated together in 1896 to trade under the name of Barclay & Company. Prior to 1896 the Lewes bank had an independent existence for 107 years, opening its doors on 1 July 1789. Ten accounts were opened on the first day of business, but within three years these grew to over 4,000. Later there were branches in East Grinstead, Tunbridge Wells, Battle, Eastbourne, Hailsham, Uckfield, Seaford & Newhaven. There were already two other banks in the town, Thomas Harben’s Lewes Old Bank founded in 1782 and another run by the Quaker Richard Peters Rickman. However, in 1793 both of their rivals ceased business. Thomas Harben’s bank failed, leaving the new partnership to take over both its assets and its name. They also took over its manager, Thomas Dicker, later to became a partner. In the same year Richard Peters Rickman wound up his Lewes bank, meeting all his liabilities (as a Quaker was bound by his religion to do) but transferring his sphere of operations to Brighton. After 1793 the Old Bank had no direct competitors in the town for over 20 years, although members of the Rickman family continued very active in the provision of mortgages locally. Richard King and Benjamin Comber both died in the first years of the 19th century, neither leaving any heirs to continue their partnership. Harry Hurly and Thomas Dicker joined in their place, and in 1822 Thomas Dicker was succeeded by his son and heir of the same name. However, after Harry Hurly’s death in 1837 and the retirement of Thomas Dicker junior in 1853, all the Old Bank’s partners bore the surnames Whitfeld or Molineux. Francis Whitfeld (1746-1807) came to Lewes from Ashford, Kent. When he died his only son was a clergyman and a senior fellow of St John’s College, Cambridge, so his interest in the bank passed to his younger brother Lewis Whitfeld (1747-1812), who also moved from Ashford to Lewes. Lewis Whitfeld was succeeded by his son Thomas Whitfeld (1790-1875), who was a partner for about 60 years; then by Thomas’s eldest son George Whitfeld (1822-1891); and finally by Thomas’s sons Francis Barry Whitfeld (1852-1924), Herbert Whitfeld (1858-1909) and Thomas Stanley Whitfeld (1860-1926). The last three all continued as local directors of Barclays after the 1896 merger. Thomas Whitfeld established a country residence, Hamsey House, that remained in the family until Francis Barry Whitfeld’s death in 1926. Joseph Molineux’s father, also Joseph Molineux, had moved from London to Lewes early in the 18th century. He was high constable of Lewes in 1745 and 1764. His son Joseph Molineux (1754-1813) was described as an ironmonger when founding the bank, but was also a founding partner in the paper mills opened at the Pells in 1802 and in Isfield in 1807. He was succeeded as a partner in the bank by his son George Molineux (1791-1855); his grandson George Molineux (1816-1893) and his great-grandson Philip Horace Molineux (1844-1928). However, Philip Horace Molineux retired in the 1880s so another of George Molineux junior’s sons, Major Harold Parminter Molineux (1850-1923) was recalled from his army career to continue the family interest in the bank. The Molineuxs had houses and property in Isfield, and later in Eastbourne. Major Harold Molineux, an enthusiastic thespian during both his military and banking careers, became a local director of Barclays, based in Eastbourne. Sources: www.archive.barclays.com; Alan F. Hill, ‘A Lewes Banking House’, Sussex Industrial History, vol.24, pp.25-29 (1994); supplemented by information from a wide of title deeds, local and national directories, censuses, local and national newspapers and the work of family historians. At County Hall John Vine, aged 65, a cripple on crutches, was charged before the magistrate George Whitfeld with taking Eliza Taylor, daughter of Elizabeth Taylor, widow, of Spring Gardens, from her home, she being under the age of 16. The couple had been found by the police living in a single room he had rented in Poplar. However, as the mother had now ascertained that her daughter had reached her 16th birthday in March, Mr Whitfeld said he had no power in the matter, and the prisoner was discharged. Thomas Twyne, M.D. Thomas Rickman, F.S.A. John Rowe Thomas Walker Horsfield, F.S.A. Richard Russell, M.D., F.R.S. Mark Antony Lower, F.S.A. Rev Henry Michell, vicar of Brighthelmston William Durrant Cooper, F.S.A. Thomas Paine William Figg, F.S.A. Four portraits are shown below. He also documented four Lewes men who lived to be over 100. This entry was posted in Antiquities, Art & Architectural History, Biographical Literature, Economic History, Family History, Lewes, Local History. Bookmark the permalink.